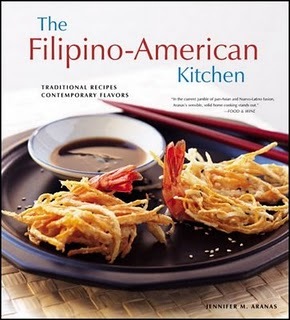 The Filipino-American Kitchen: Traditional Recipes, Contemporary Flavors, by Jennifer M. Aranas. Puerto Ricans and other Latin Americans will certainly recognize sofrito, the basis of many a savory dish! Recipes include Suman Nga Baboy (Steamed rice cakes with bacon & caramelized onions, wrapped in banana leaves); Pancit Guisado (Stewed Noodle Dish), Adobong Pato a la Monja (Duck adobo with pineapple and dates – looks like this preparation originally came from a convent – a la Monja means “in the style of nuns”); Pineapple and Cassava Tarts, Halo Halo (Filipino fruit sundae), and much more. Check it out!! Primarily a nutrition and fitness guide, with a good dollop of history, the cooking advice and recipes begin on page 113 of this 194-page book, and end on page 160. 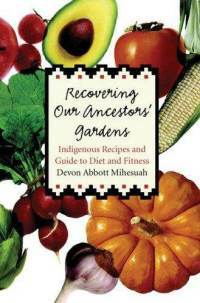 Recipes included come from many different tribes, or feature well-known indigenous ingredients such as tomatoes, corn, beans, and squash. Most recipes have been contributed by women and men from the Choctaw, Comanche, Osage, Dakota, Cree, Cherokee and Eastern Cherokee, Luiseño, and Seminole nations, along with a number of Mexican / Southwestern traditions, such as guacamole and salsa. A number of the recipes include traditional preparation techniques, such as the recipe for Dakota Waskuya (Dakota dried sweet corn soup). The ingredients are dried sweet corn and meat, with suggested meats being “venison, buffalo, elk, or beef.” No quantities are listed, so you know this is a recipe for experienced cooks! The preparation begins with instructions on how to dry boiled and shelled corn in the sun, a process that takes days and which the author frankly calls “labor-intensive.” Much later when the corn is dried, it is cooked with the meat until tender. For those interested in understanding traditional ways of preparing traditional foods, this book can provide some useful insights along with recipes. Other interesting recipes include Ta-pashe (Osage pounded meat), Luiseño Weewish, Choctaw Banaha, and Wah-zha-zhe wa-dsiu-e cta-i-ge (Osage persimmon cakes), along with many recipes for game meat (venison, elk, buffalo), breads, and numerous vegetables. I think I’m going to have to try Mamaw Helton’s creamed corn tonight! 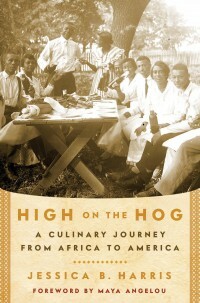 Ms. Harris provides essays that detail the historic and cultural foundations of these two culinary traditions, beginning of course with chapters on African foods and ceremonies, the Middle Passage and the resulting profound influences of African food traditions on American food from the earliest days to the present. Recipes (a number of which appeared in Harris’s earlier cookbooks, The Africa Cookbook: Tastes of a Continent; TX725.A1 H284 1998, and The Welcome Table: African American Heritage Cooking; TX715 .H31443 1995) begin on page 247 thru page 265, and include the glorious triumvirate of okra plus tomatoes plus fiery hot chili peppers as Sauce Gombo to be splashed atop rice; Summer Southern Succotash (again, tomatoes plus okra plus corn and those super hot peppers). Side note: You can’t help but notice the fusion of Latin American indigenous ingredients – xitomatl (tomatoes); chilli (chili peppers); elotl (corn) meeting up with Africa-native okra. We know the historic reasons for that fusion are the slave trade and Spanish and Portuguese colonization of the New World – Mexico, the Caribbean, Central and South America. The slave trade brought foods from one part of the world to another, including the diffusion of these foods into European cuisines. 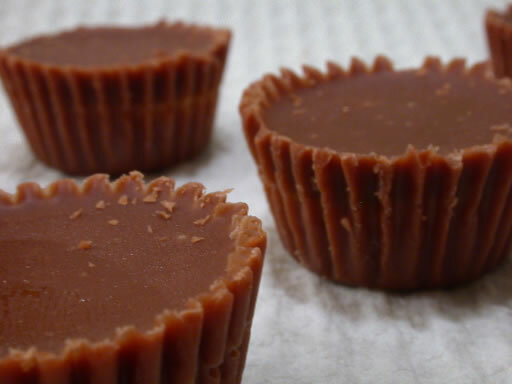 The mundane yet heavenly peanut butter cup, formerly advertised in the US as a marriage between peanut butter and chocolate, is a child of this same African-New World diffusion. But I digress! There’s also an interesting western cowboy stew called Son of a Gun Stew (note: an organ meat lover’s delight); the classic Fried Chicken and Macaroni and Cheese, and several good recipes for greens. This is obviously a good choice for learning about African American foodways, while Ms. Harris’s previous books mentioned above will be great choices for many, many more African and African American recipes. Taking a quick break to go make dinner – thinking about Pastel de pollo, one of my own “go to” dishes… but before I head off, here’s how you can find cookbooks in our collections. Call numbers will most likely begin with TX… and are housed on the Lower Level of Parks Library. Enjoy!! This entry was posted in African American, American Indian, Asian American, Collecting, Finding, Latino and tagged cookbooks, ethnic studies, libraries, race by biblionotes. Bookmark the permalink.